We have awarded BLU CIGS 4 STARS. IT IS RECOMMENDED WITH CERTAIN RESERVATIONS for people who are attempting to quit smoking or who simply want to take advantage of a healthier smoking option. If you are not a purist when it comes to the flavor of your tobacco, this could be the ideal electronic cigarette for you. In January, 2011 a new two-piece design was introduced by Blu Cigs. Maintaining pace with the latest innovations in e-cigarette technology, it is no longer necessary to use separate atomizers and these are now built directly into the flavor cartridge. The new cartridge/atomizer combinations are completely compatible with all Blu Cigs chargers, cigarette style batteries and other e-cigs accessories – a very significant benefit for Blu Cigs users who bought kits before this major design change took place. We instantly purchased and tested these new cartridge/atomizers. Following our policy of total disclosure, our review has been amended to remain relevant to the product that is currently offered. Revisions to both evaluation scores and pricing references have been also been made accordingly. The quality and design of the product, its packaging and its accessories made a formidable impression on us the moment that we opened our delivery; everything appeared to be well-crafted and designed for optimal convenience. We opened the Classic Tobacco box next and equipped one of the two included batteries with a cartridge/atomizer combination before taking several quick puffs. A pleasing blue light was produced by the LED tip and we took instant note of how easy the unit was to draw on. It produced only an average vapor volume, but certainly an acceptable one. The cigarette itself was a major plus. It was and remains the lightest, most compact and easy to hold e-cig that we have tested thus far – and we will happily add that it very elegant and attractive with its sleek design and appealing blue LED tip. The Classic Tobacco flavor was definitely pleasing, however, almost all of our judges agreed that the flavor tasted quite a bit like vanilla. We next tested the Cherry Crush flavored cartridge/atomizer while using the spare battery. Almost all judges agreed that the taste of this was both pleasant and not unlike smoking cherry flavored pipe tobacco. The Java Jolt filters were found to provide a rich and optimal coffee flavor. Mixed reviews were given to the Magnificent Menthol filter cartridge as most agreed that this too, tasted quite a bit like vanilla. Vanilla is a common flavor additive among numerous manufacturers of e-cigs. You can purchase the new Blu Cigs Starter Kit in four Nicotine strengths (Full Flavored, Light, Ultra Light and Non-Nicotine) and in one of four flavors (Magnificent Menthol, Classic Tobacco, Java Jolt and Cherry Crush. The Portable Battery Pack from Blu Cigs received raves from all around. The ability to plug the unit in and charge it enables smokers to use it while away from home as a cordless battery charger. Rather than connecting your Blu Cigs to your wall or USB chargers, you simply insert it in the portable battery pack. It is additionally very convenient to be able to tote around your e-cigs and extra filters. Of all the brands that we have tested, Blu Cigs was the only one to offer this very useful option in its Starter Kits. According to our estimations, the cost of maintaining a single pack-per-day habit when using Blu Cigs was $770.75 per year, $64.23 monthly, $14.82 each week or $2.11 daily when factoring in the cost of the $79.95 Starter Kit. These calculations were based on the routine changing of the atomizer once every five flavor cartridges. This is one of the lowest priced starter kits that we have reviewed, making this a very high value option. In addition to purchasing flavor cartridges, however, smokers must also factor in the cost of each atomizer and at $5 apiece, smokers are essentially adding $1 to the price of every filter, although these have a very nominal cost of $1 each. Compare this cost to the cost of smoking real tobacco cigarettes in the maintenance of a single $6 pack per day habit which will cost $42.12 each week, $182.50 each month or a whopping $2,129.00 each year. This is even before factoring in the value and benefits of avoiding the many pulmonary and lung-related health risks that can be avoided by switching to e-cigs. We have awarded BLU CIGS 4 STARS. IT IS RECOMMENDED WITH CERTAIN RESERVATIONS for people who are attempting to quit smoking or who simply want to take advantage of a healthier smoking option. If you are not a purist when it comes to the flavor of your tobacco, this could be the ideal electronic cigarette for you. 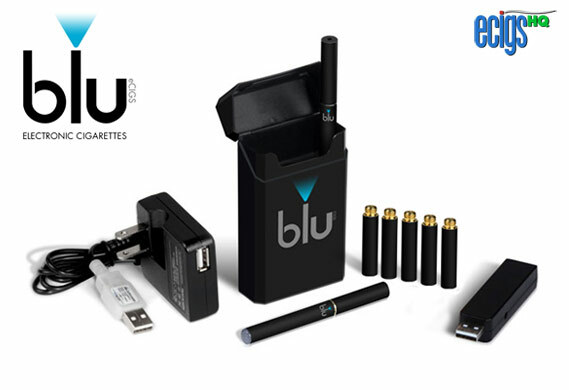 In conclusion we found the lightweight and compact design of Blu Cigs e-cigarettes to be extremely easy to use, aesthetically pleasing and of optimal value. Blu Cigs does not presently provide coupon codes.